It wasn’t pretty, but the Patriots defense put together a stellar effort after shutting down the Rams and carrying New England to their sixth Super Bowl Championship on Sunday night. Patriots quarterback Tom Brady didn’t have his best game, but he came up big when it mattered most as the Patriots took care of Los Angeles in a 13-3 win, capping off what will likely go down as one of the more memorable seasons given how tough it was to get this one. 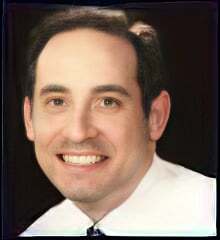 Here are some thoughts on this one. 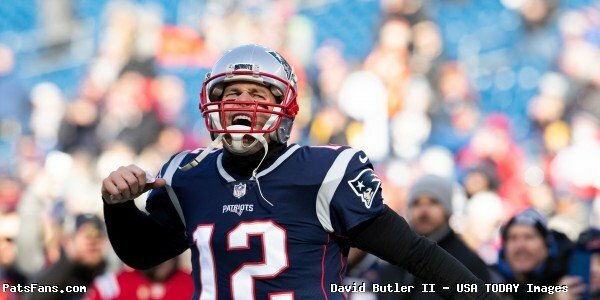 1) It wasn’t Brady’s best, but he was clutch when he needed to be – Expect the offseason to be dominated by the talking heads who will likely dissect Tom Brady’s Super Bowl performance, likely trying to pour water on the quarterback’s championship outing. Give the Rams credit. They were disruptive and made things tough, including on the Patriots first drive of the game after they had driven down to the Rams 34-yard line. Brady was picked off on his first pass attempt of the night after he tried to throw outside to Chris Hogan without seeing a defender step into his lane. Hogan tried to bat the football down, but it ended up in the hands of Nickell Robey-Coleman, who had talked trash all week about Brady leading up to this game. Overall, Brady finished the game 21-of-35 (60%) for 262-yards and the interception, including just 1-of-4 on third down in the second half. However, he was big in the fourth quarter, hitting 4 of his five 5 passes (80%), including a perfect 4-of-4 for 67-yards during their lone scoring drive of the night. Say what you want, but this game resembled his original Championship run against the St Louis Rams where he did just enough to win the game in what was also a solid defensive performance by New England. 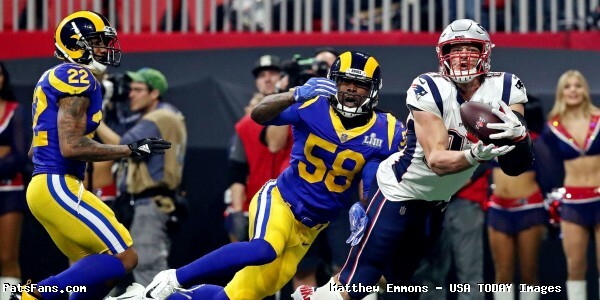 The Rams have a terrific defense, but save for Brady’s one miscue, the Patriots were clearly the more poised offense in this one and it ended up ultimately being the reason why they walked away with their sixth Lombardi Trophy. 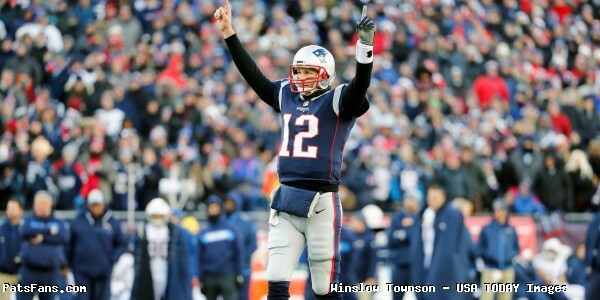 As a result, Brady became the only quarterback in NFL history to win his sixth career championship. It may not have been easy, but the win obviously counts regardless of the score, with the Patriots being the ones who found a way to win. Fortunately, for the sixth time, Brady was also one of the reasons they managed to do just that. 2) What an effort by New England’s defense – For a group that took a lot of heat for much of the season, the Patriots defense had played arguably their best game of the year two weeks ago out in Kansas City. On Sunday night, they proved they were far from finished. They took things even further against the Rams in what was the most dominant performances we’ve seen in recent memory, pitching a near shutout in a game that could have easily been a blowout had the offense performed better. They completely dominated the Rams in the first half, holding them to just 2 first downs as Los Angeles went 0-for-6 on third down and were shut out through the first two quarters. During that time they made quarterback Jared Goff completely miserable, forcing him out of the pocket and sacking him twice, while also knocking him around. Goff finished the first half just 5-of-12 for 52-yards, with the Patriots holding the football for nearly 20-minutes. Those problems continued in the third quarter where Goff completed just 4-of-9 for 43-yards and it wasn’t until the final two drives where Goff was trying to answer the 10 points the Patriots had added that he had any real success. However, after his second to last drive ended with an interception to Stephon Gilmore, it was simply too late. 3) Todd Gurley – Was stopped for no gain on a carry in the 3rd quarter. 4) Todd Gurley – Had a reception for a 1-yard loss early in the 4th quarter. 5) C.J. Anderson was brought down for a 3-yard loss on a carry in the second quarter. 3) The fans who were on hand were terrific – Considering all the problems this team has had away from Gillette Stadium at times this season, Sunday night allowed them to settle in as the crowd was clearly dominated by Patriots fans who were there to support the soon-to-be World Champions. They were loud all night, with the crowd noise clearly audible in the broadcast. They seemingly helped force some pre-snap penalties and were deafening on multiple occasions on third down, including when the Rams were backed up in their own territory. You couldn’t have asked for a better crowd. They were a big factor in key moments and the players commented after the game about how big of a difference they made. Tom Brady with his daughter in his arms at the podium praises the fans: "The support here tonight was like a home game, we could have been at Gillette Stadium." Most reports said that Patriots fans vastly outnumbered Rams fans 4-1, which considering how many of these this football team has been to, it’s truly impressive. As Brady said, it certainly sounded like they were at Gillette Stadium, so kudos to those who were there who helped make them feel right at home. 4) Another gem for Michel – Patriots running back Sony Michel put together another solid outing on Sunday night, albeit the Rams defense certainly made him work for it. 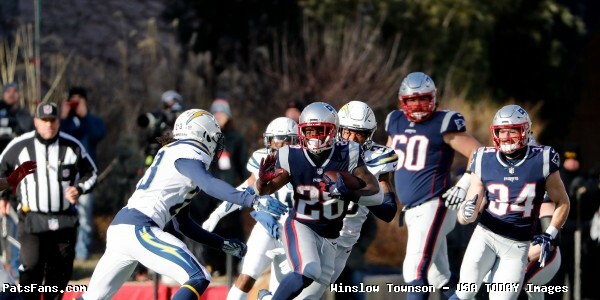 The rookie carried 17 times for 92 yards including the game’s only touchdown, but played a key role in the final quarter as he rushed for 41 of those yards, including a 26-yard gain with under 3-minutes left to play that helped set up Stephen Gostkowski’s game-clinching 41-yard field goal with 1:16 left to go in the contest. 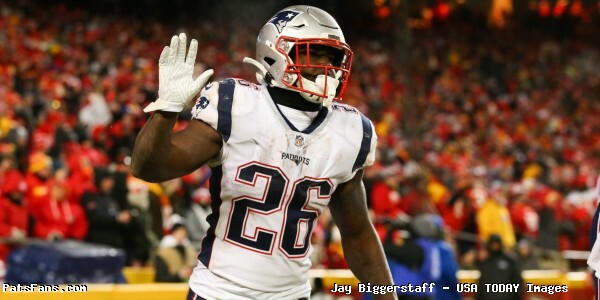 While he may not have necessarily been the player people wanted when the Patriots took him in the first round before the season, there’s no denying that the rookie played a clear role in the team’s championship run. He’s been a difference-maker all season and he did a great job once again in a game where they certainly needed it most. Michel finishes the postseason with 71 carries for 336-yards and a team-leading 6 touchdowns. Losing Chung was tough Sunday night. 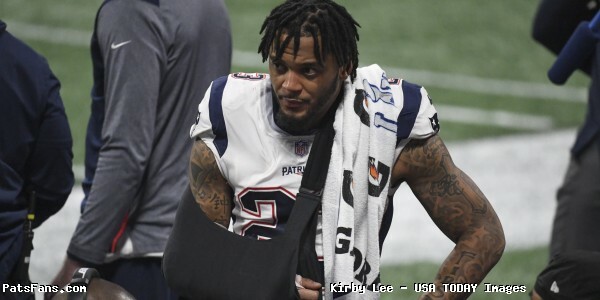 5) Big Loss in This one After Chung Went Down – Patriots Safety Patrick Chung ended up a casualty of this game after the safety suffered an apparent broken arm in this game. 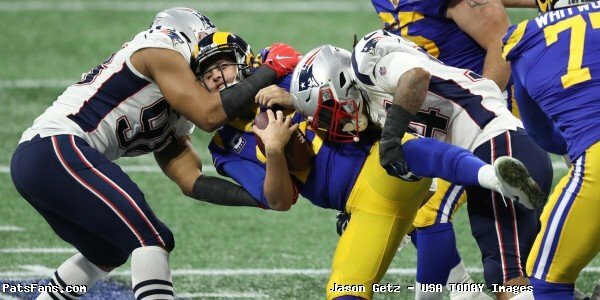 Chung went down on just the third play of the third quarter after coming up to make a tackle on Rams running back Todd Gurley. He went down immediately after the play, screaming in pain and clearly frustrated with the realization his night was over. Trainers came onto the field and put the veteran’s arm in an air cast and also brought the cart out to take him off the field. However, Chung refused to get on it, opting instead to walk off the field under his own power. 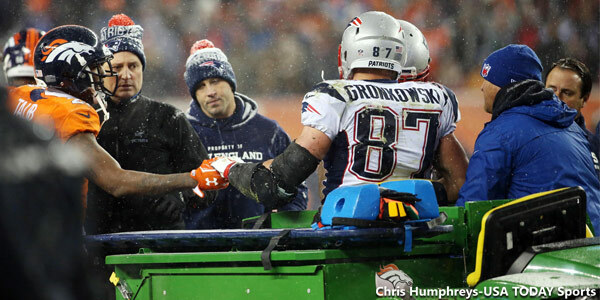 He later returned to the sideline with his arm in a sling. That left his duties in the hand of Duron Harmon, who stepped up and played well in his absence. Best wishes to Chung, who has been terrific all season and is a big part of this defense. Fortunately, thanks to his team closing this one out, he was spotted after the game looking like he’ll be just fine. 6) Terrific night by McCourty – It’s hard to believe in preseason there were so many people wondering whether or not Jason McCourty would even make the team, let alone be a potential difference-maker in one of the most important games of the season. 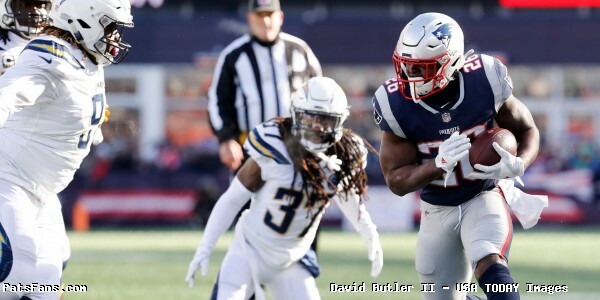 McCourty came up huge late in the third quarter, coming in at the last minute in what appeared to be a blown coverage to knock the football away from a wide-open Brandon Cooks in the end zone. It was a brilliant play and at the time it forced the Rams to have to eventually settle for a 53-yard field goal, which tied the game at 3-3 with 2:11 left to go in the quarter. Had Cooks caught the touchdown, the Rams would have had the lead and potentially the momentum, which obviously could have seen this game turn out differently. It was great to see as McCourty has been a quiet contributor all season and Devin has mentioned repeatedly what an incredible experience it’s been for him to finally have the opportunity to play on an NFL team with his brother. Given how the game ended and how that play turned out, Patriots fans are certainly glad Jason was a part of this as well. 7) Ryan an unsung hero – Thanks to what turned into a defensive battle, the punters each ended up with an expanded role Sunday night and it was clear that Allen proved to be an incredibly important asset in this football game. Allen really had a great night. 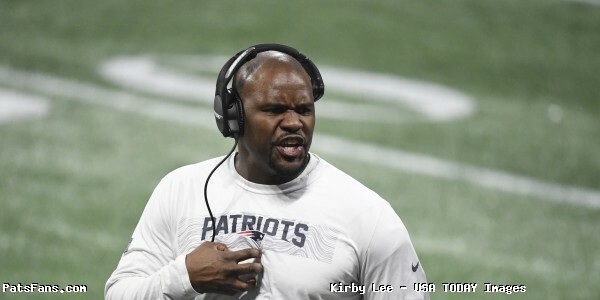 He helped the Patriots win the field position battle and forced the Rams into multiple occasions where they were forced to start the game inside their own 10-yard line. Ryan and fellow special-teamer Matthew Slater pinned the Rams inside their own 10 three times on the night, forcing the Rams to have to try and drive the length of the field each time after New England’s secondary did a good job of preventing the big play. That played right into their hands as Goff simply couldn’t do it, leaving them to exchange punts with the Patriots until Brady and the offense finally wore down their defense and scored their 10 points in the final quarter. One small note on Ryan, he had his Super Bowl record 64-yard punt taken away after Rams punter Johnny Hekker hit a 65-yard punt of his own Sunday night, snatching the accolade away from Ryan. Ryan will likely take it, since he now has yet another Super Bowl ring to help him get over it. 8) There was context behind Gostkowski’s miss – Finally, our thoughts go out to Stephen Gostkowski, with Mike Reiss reporting that the kicker lost his grandfather on Saturday night. That potentially adds context to the earlier first quarter miss by Gostkowski, who was clearly playing this one with a heavy heart and ended up pushing his first 46-yard field goal attempt of the night wide-left. Fortunately, Gostkowski did manage to hit the most important kick of the game, after nailing the game-clinching field goal down the stretch, which made it a two-score game and put it out of reach and ruined any shot at a Rams comeback. It was a huge kick, and it’s one of the big reasons why the Patriots will be bringing their sixth Lombardi Trophy back to New England this week. Brady said after the game that he’s looking forward to going after another one in 2019. 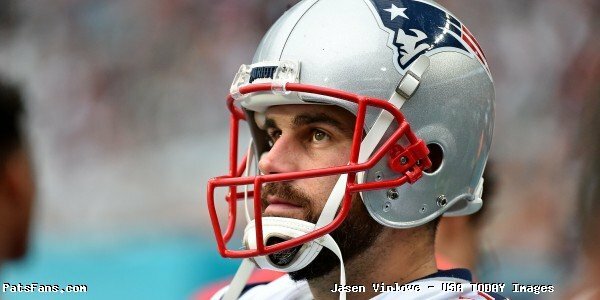 Expect the Patriots to make some additional personnel moves this offseason to hopefully make them even more dangerous as they begin building the group that will hopefully help him get there next season. This entry was posted in 2018 Patriots playoffs, Patriots Commentary on February 4, 2019 by Ian Logue. Whether or not Rob Gronkowski returns next season will likely be a problem the Patriots might eventually need to deal with, but Sunday night reminded us that having Julian Edelman around at least makes any issues they may have a little easier to deal with. 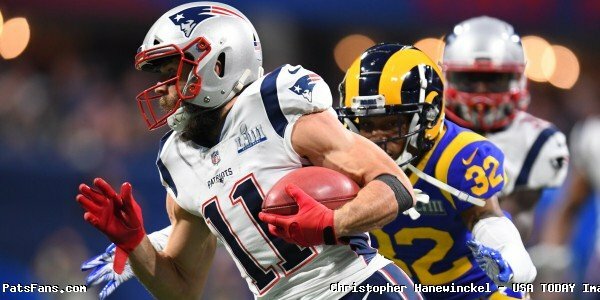 Edelman came up big on Sunday night, putting together one of his best performances when they needed it most, with the veteran receiver catching 10 passes on 12 targets for 141-yards, seven of which came in the first half. He was a big key in this one, with Edelman coming up with several big plays, finishing with three catches of 25-yards or more. He was also big for Brady on third down, with the veteran targeting him 5 times with three receptions and three first downs. 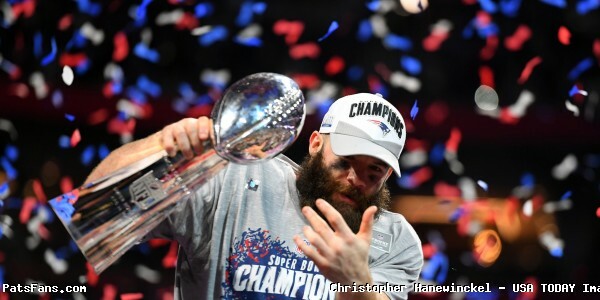 It was another big night for Edelman, who was also an important part in each of their previous two recent Super Bowl victories, one of which came without Rob Gronkowski during the 2016/17 postseason. Edelman wasn’t part of last February’s loss to Philadelphia after missing it with a knee injury, with the Patriots now 3-0 in the last three Super Bowls where he’s been healthy. The veteran also earned his first Super Bowl MVP thanks to his performance, but he credited the defense for the win after the incredible night they put together. Nevertheless, it’s an honor that he can now add to his resume. With the parade now scheduled for Tuesday in Boston, Edelman is asking for “record numbers” now that “we just got six [championships]”. 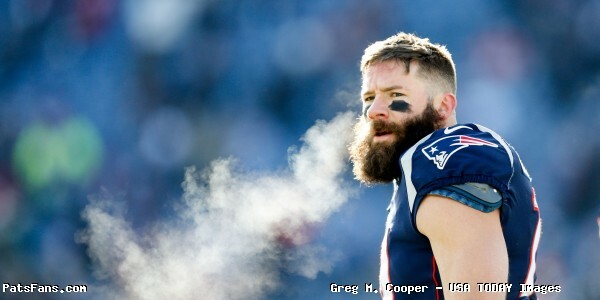 This entry was posted in 2018 Patriots playoffs on February 4, 2019 by Ian Logue. Most Patriots fans generally like to feel pretty good about their football team, but this year’s group has certainly challenged that faith at times this season. It’s strange, despite their 11-5 finish, it’s safe to say it’s been a tough year. 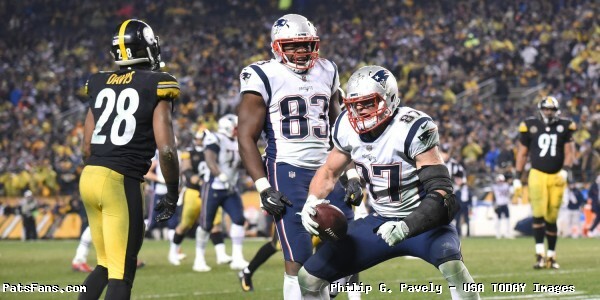 New England was a team who didn’t start off well and didn’t exactly finish the 2018 regular season in convincing fashion, which had most fans left with more questions than answers heading into the playoffs. In September, they struggled out of the gate after suffering defeats out in Jacksonville and Detroit, as well as dropping two big road games down in Miami and Pittsburgh down the stretch in December. That left most people wondering how they’d play when the postseason started. Yet, they surprised most people with how terrific they looked in each of their two victories against clubs who many pundits predicted would end their season, largely because of how inconsistent the Patriots had been for most of the year. They didn’t think they’d look anything like they did once the bright lights of the playoffs switched on. Meanwhile, the two teams New England beat to earn this trip to Atlanta, the Chargers and Chiefs, each came into the postseason on a relatively high note. The Chargers had won two out of three games, including getting past the Ravens in the Wild Card round with a hard-fought 23-17 win. The big question at the time was whether or not the Patriots had enough personnel to put up much of a fight, or if they were healthy enough to keep up with a Phillip Rivers lead offense that had been one of the best of his Chargers career. Instead, the Chargers saw their defense let them down as Tom Brady sliced and diced it in a 41-28 victory that wasn’t anywhere near as close as the final score would indicate. The critics after the game blamed it on the failure by Los Angeles to adjust on defense, despite the fact New England was having their way with them. As a result, very few seemed to feel the Patriots would have that same success against the Chiefs. Brady and the offense dominated the Chiefs in the AFC Championship. But that ride continued, with the Patriots maintaining terrific execution as they dominated the time of possession by moving the chains and keeping Patrick Mahomes off the field. The offsides penalty by Dee Ford that nullified a game-sealing interception by Kansas City has been the topic of discussion all week, calling the Patriots lucky while believing New England shouldn’t have advanced. However, one of the things that really has stood out during this run is the fact it really doesn’t matter how a team plays during the regular season, it’s more about getting hot at the right time. And fortunately for the Patriots, they’ve been on fire. Let’s be honest, New England wasn’t able to string together a consistent stretch all season, leading to some ups and downs that were frustrating. We didn’t know what to expect from one week to the next, and it was like that all the way up until the very end of the season. The good news is, they’ve played their best football in the last two weeks, which is exactly why they’re still here, much the chagrin of the rest of the country. All those opposing fans clearly hoped it would be Mahomes and Company. Thankfully, Brady and his teammates ended up writing a different script. Most of that success came thanks to their turnaround on 3rd down, which was their Achilles Heel all year. During the regular season, they converted just 41% of their third down attempts, with Brady completing just 52.4% of his passes. In the playoffs, it’s been a completely different story. They’ve converted 60% of their third downs, with Brady completing a staggering 82% of his passes. That’s the type of play they’ve been looking for all year, and it’s probably the first time during Bill Belichick’s tenure that he’s seen his club wait until it matters most to finally start playing their best football. As the saying goes, better late than never. With just a couple of days to go before they battle the Rams, the timing certainly couldn’t be any better. With some still questioning nationally whether or not this Patriots team is for real, there’s clearly no shortage of motivation within that locker room with players who would love nothing more than to prove them wrong. Brady is looking to prove the doubters wrong this weekend. The Rams, meanwhile, are a team that joined the Chiefs as a club who could put up points in a hurry and many believe that coupled with their defense, are the team best suited to win this weekend. Rams defensive coordinator Wade Phillips has had success against Brady, with the quarterback having completed just 58% of his throws in his last six games against Phillips’ defense during his tenure with various teams. He’s also completed just 45% on third down over that same span. But this year just feels different. And in a completely different way than the “different” people were talking about earlier in the year when people thought they just didn’t have enough to end up where they are right now. It’s funny how much things can change and a reminder that perceptions in September and October don’t really matter. Even how they look in December isn’t necessarily an indication of what’s to come, either. Fortunately, it all came together at the right time. Brady is clearly playing with a chip on his shoulder and this team looks overall like as much of a tightly-knit group as we’ve seen in years, with both sides of the football executing better than they had all season. Thankfully, it’s led to two memorable wins. Hopefully, they’ll cap it off with a third on Sunday. This entry was posted in Uncategorized on February 1, 2019 by Ian Logue. Patriots players are used to the motto “ignore the noise” and there certainly is plenty of it out there following New England’s terrific overtime AFC Championship win over the Chiefs Sunday night. One of the frustrating parts of Sunday’s game for Chiefs fans was the fact Patrick Mahomes was nothing more than a spectator during the overtime period, which saw Tom Brady march down the field and drive the dagger into their hearts with a walk-off touchdown drive. That moment silenced the fans who had screamed their lungs out all night, with those who were still on hand forced to watch the Patriots celebrate on their home field as the Chiefs’ fairy-tale season came to an end. It was a tough Monday. They’re trying to grapple with the reality that any shot they had for a magical finish is over, which now sees them rooting against the Patriots with a vengeance alongside a Rams fanbase that will need all the help they can get after even their own supporters didn’t show up in force to cheer them on against the Cowboys two weeks ago. Sunday’s loss is a gut punch, we know, we’ve been there. You grasp at straws and intermittently even forget that there’s no time machine to bring the game back to a moment where they can possibly do it over and erase what just happened. With Kansas City not touching the football in overtime, they’re upset that things came down to a coin flip, believing the sudden death rule of scoring a touchdown should be changed. Many throughout the national media believe the same, with quite a few talking heads also hoping that that rule gets some consideration this offseason. 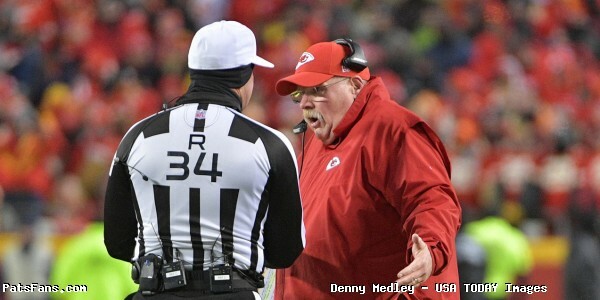 Just think, if the Chiefs had won, we wouldn’t be having this conversation. Fans in New England would instead be evaluating all the plays they didn’t make and the missed opportunities. Those would be the topics of conversation. We’d be talking about the interception in the end zone in the second quarter that destroyed a key scoring opportunity for the Patriots, which played a part in allowing the Chiefs to get back into it. We’d be talking about the missed fourth down conversions. You know, things like that. But the Patriots came out on top, so let’s skip things like logic and reason and let the “unfairness” begin. It’s ridiculous. They’re trying to make the argument (and they’re wrong) that the Chiefs should have gotten one more chance after squandering countless others all night to match New England’s touchdown. 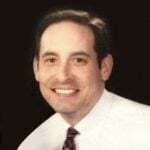 However, when you have a defense who can’t stop anyone and a quarterback who was the real reason the Chiefs got as far as they did, you tend to freak out and join all the other opposing fans around the league and start beating the drum for a rule change. Disagree? Well, all you need to do is take one key factor into consideration and realize that what happened to close this one out is the reason why the NFL already made the right call when they decided to force teams to have to score a touchdown to win the game instead of a field goal to begin with. Brady had to put together a 13-play drive to close Sunday’s game out. In order to win this football game, the Patriots had to put together their second-longest drive of the night, with Brady forced to dig deep one last time and put together a 13-play sequence in order to punch it in for the game-winner. They also had to convert three 3rd-and-10s along the way, each of which required precision throws and terrific plays by Julian Edelman and Rob Gronkowski to keep it going, with the Chiefs giving up plays of 20, 15 and 15 yards respectively. It’s really simple. When you give up plays of 15+ three times on third down in overtime, you deserve to lose. That would be the narrative if the roles were reversed and Patriots fans know that better than anyone given past experience. In the meantime, that won’t stop anyone from complaining about the outcome and the rule in place they feel took away their shot. Maybe they can spend the offseason watching the film and realizing there were bigger reasons why they lost the game. Maybe they’ll realize that had Kansas City managed to put up a single point with their high-powered offense in the first half, things might have turned out differently. Sunday night saw the Chiefs put together just two drives of more than five plays, relying on big plays to help put them in position to score. On the other side, the Patriots offense consistently sustained drives, with 7 of their 12 drives lasting 8 plays or more, including four that went for 10+ as they ate up the clock and kept the football out of Mahomes’ hands. Michel had a big night Sunday night. Holding onto the football requires precision and execution to move the ball down the field and keep the chains moving. Sony Michel, who rushed for 113-yards on the night against the Chiefs defense, credited the Patriots offensive line for allowing them to put those drives together and set the tone early. Meanwhile, despite Kansas City’s 24-point fourth quarter, New England held the ball for 11:47 compared to just 3:13 for the Chiefs. 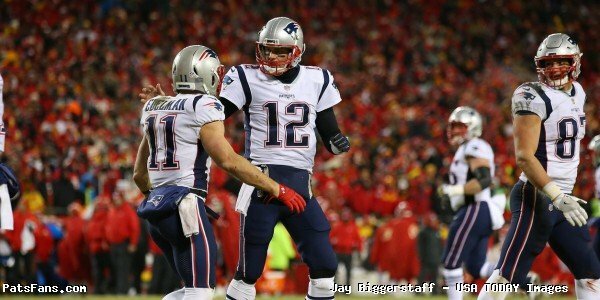 While the Chiefs eventually made some big plays down the stretch, as explosive as they were, it came down to execution as the reason the Patriots came out on top. Chiefs linebacker Dee Ford admitted as much after the game. Good teams find a way to win in big moments. Give the Chiefs credit, they forced this one to come down to the wire and gave the Patriots all they could handle. Fortunately, Brady and the offense maintained their poise and executed at a championship level, especially when it mattered most. And as much as it might hurt all the Patriots haters to admit, that, not the overtime rule, is the real reason why the Patriots are moving on to Atlanta. This entry was posted in 2018 Patriots playoffs on January 22, 2019 by Ian Logue. 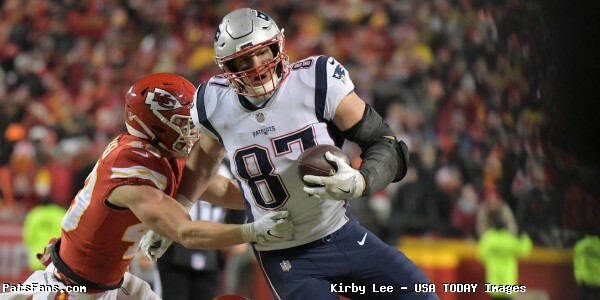 Sunday night’s battle against the Chiefs was one for the ages, with the Patriots fortunately ending up on the right side of an improbable 37-31 victory over Kansas City to send them to Atlanta for their third-straight Super Bowl appearance. Here’s a rundown of what we learned from this incredible win. 1) Terrific – and a little lucky – performance by Edelman – Julian Edelman put together a terrific outing against Kansas City and once again ended up being the difference-maker in a game where New England had to fight for every inch in a hostile environment. He finished Sunday’s game with 7 receptions for 96-yards, with 4 of those seven receptions coming on third down at critical moments, two of which were during the Patriots’ game-winning drive in overtime. Edelman did catch a break in what could have been a game-changer after making a mental error that he got a little lucky on in the fourth quarter where he initially waved off a punt, but then seemingly decided to try and field it at his own 31-yard line. Fortunately, the ball bounced just over his hands and past his arm, which at first glance the officials thought it touched him and Kansas City recovered. Replay confirmed he didn’t touch it and luckily, New England maintained possession. The bad news was, two plays later, Edelman saw a pass thrown his way bounce off his hands and into the arms of safety Daniel Sorensen for the interception. The Chiefs turned that into a go-ahead touchdown, with quarterback Patrick Mahomes finding Damien Williams for a 23-yard scoring strike, which put them up 21-17 with just under eight minutes left to play. That sequence aside, Edelman was a huge key to their win on Sunday as the Patriots managed to just enough to beat a Chiefs team that certainly didn’t make it easy. Brady was terrific Sunday night against the Chiefs. 2) A Near Flawless Showing by Brady – Like Edelman, Brady had his one miscue of the night but overall was terrific and as usual, came up big when it mattered most. He finished Sunday’s game 30-of-46 (65.2%) for 348 yards and a touchdown, but also had two interceptions, one of which was brutal. After opening the game by engineering a terrific 15-play, 80-yard drive which ate up over 8-minutes and ended with a 1-yard touchdown run by Sony Michel, he had a rare mental error on the ensuing possession. Following their opening touchdown drive, New England’s defense got the Chiefs off the field, with Brady and the offense ending up with terrific field position at the Chiefs’ 44-yard line. From there, Brady marched them down the field on 10-plays down to the Kansas City 1-yard line. However, the veteran quarterback then made an ill-advised throw after Rob Gronkowski got behind the Chiefs secondary but Brady fired it at him instead of lofting it up to him and linebacker Reggie Ragland picked it off in the end zone and killed the drive. Fortunately, that was the only real mistake he made on the night and the biggest number that stands out was the fact the Patriots converted an unbelievable 13-of-19 (68%) on third down, and Brady was part of all but four of those conversions. He completed 9-of-11 (82%) on third down, all of which moved the chains, including a perfect 3-of-3 in overtime. From the moment Matthew Slater called heads and the Patriots took the field, there was little doubt of what was about to unfold. 13 plays later, Rex Burkhead was in the end zone after Brady calmly took them down and put the dagger in the heart of every Kansas City fan in that stadium. They screamed all night and made things tough, but thanks to another incredible finish by the veteran quarterback, they quietly filed out when it was over and went home disappointed. 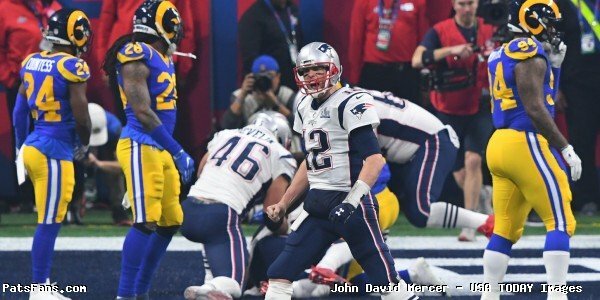 Great players come up big in key moments and Brady finished the evening with another one for the ages as he advances to an incredible ninth Super Bowl appearance. New England’s defense was solid Sunday night. 3) Terrific showing by the defense – On a night where the offense played well, they still needed a little help on the other side of the football and the Patriots defense put together an incredible performance against a tough football team. While this group will likely be criticized for the 24 fourth-quarter points they allowed, you have to give them credit for the fact they held down an explosive Chiefs team that struggled to sustain drives against them. They shut them out in the first half and did a great job of getting pressure on Patrick Mahomes, harassing him for most of the night and made two big third-down sacks in the first half, one of which took away points. 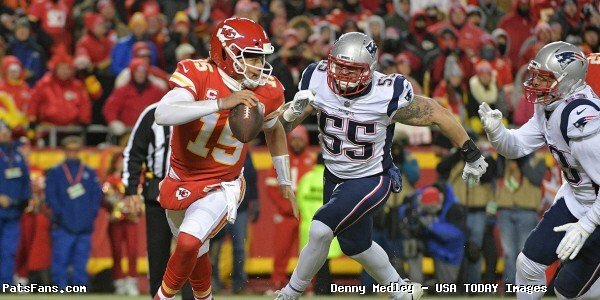 After a 42-yard play to Tyreek Hill got the Chiefs down to the Patriots 23-yard line, Trey Flowers made a huge sack on Mahomes as he tried to scramble away, which saw him lose 14-yards on the play. It was a key play by Flowers as it knocked the Chiefs out of field goal range and forced them to have to punt away the football. The Patriots then ended up putting together a touchdown drive on their ensuing possession that put them up 14-0. Plays like that are the equivalent of a turnover and you have to give them credit for holding the Chiefs in check the way they did in front of their home crowd. Granted, Kansas City obviously had their moments, but luckily the Patriots ended up with more of them after knocking off the AFC’s top seed. Gronkowski played well during the Patriots win. 4) Great to see Gronk doing Gronk-Like things – Like Edelman, Rob Gronkowski’s night wasn’t perfect but he was absolutely huge both in the passing game and in the running game. The veteran tight end was quietly one of the big contributors to Sony Michel’s night running the football, making several key blocks in this game while also managing to make some key contributions catching the ball when it mattered most. Gronkowski finished the evening with 6 receptions for 79-yards, his last of which came in overtime on a key 3rd-and-10 that went for 15-yards. That reception put them down to the Chiefs 15-yard line and helped set up Burkhead’s game-winning 2-yard touchdown run. He was solid in this game, albeit a little lucky. He had a third down sequence that could have ended up significantly differently, which came with a minute left to play in the game. Trailing 28-24, Brady threw a pass to Gronkowski to the right flat that went through the tight end’s hands and was picked off by Chiefs defensive back Charvarius Ward for what appeared to be a game-ending interception. However, Chiefs linebacker Dee Ford negated the play after he jumped offsides prior to the snap, taking away the the turnover. Gronkowski would catch a 25-yard pass on the next play, setting up New England’s go-ahead score thanks to a 4-yard touchdown run by Burkhead, putting them up 31-28 with 0:39 left to play in regulation. Gronkowski appeared happy and relieved when this one was over and it was good to see him have such a terrific showing after what’s clearly been a difficult year for him. While he certainly doesn’t appear to be 100%, he’s been solid enough where the Patriots should like their chances if he can pull together one last big effort against the Rams. Michel was outstanding Sunday night. 5) Michel was huge, again – For those people out there still resentful of the fact the Patriots spent a first-round pick on Michel, it’s hard not to appreciate the fact that the team wouldn’t be in this position without him. Michel came up with another 100-yard rushing performance, totaling 113-yards on 29 carries along with two touchdowns, including a huge one on 4th down in the fourth-quarter. On the play, Michel broke away on a 4th-and-1 from the Chiefs’ 10-yard line, scampering into the end zone after he slipped past the defense. 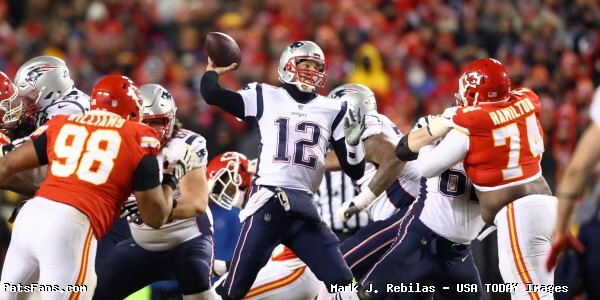 That touchdown play was a critical moment, as it not only allowed the Patriots to re-take the lead, but they also took back the momentum after the Chiefs had scored the go-ahead touchdown on their previous possession following Brady’s interception. 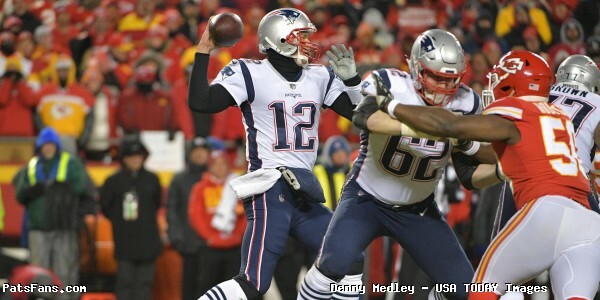 On a night where the weather and the elements certainly played a factor, Michel’s performance wore down the Chiefs defense and allowed the Patriots to dominate the time-of-possession battle after New England held the ball for over 40 minutes, keeping the ball out of Mahomes hands and limiting what damage Kansas City was able to do offensively. 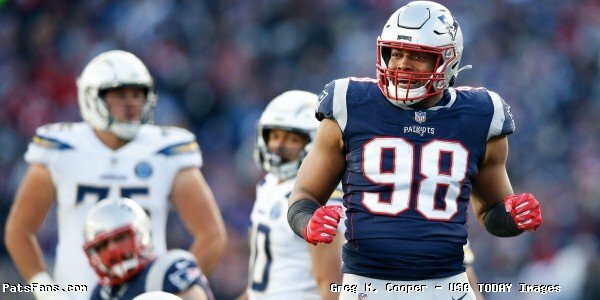 Without Michel, it’s hard to believe that the Patriots would have been able to have been as effective as they were and at this point, he’s more than held up his end of the deal as a first-round pick. Given that not everyone drafted in the first round is a guarantee in terms of their contributions, Michel has definitely given them a championship-caliber effort with the way he’s run the football. For a team that seemed to be in tough shape earlier in the year offensively, thanks to Michel, this group appears to have finally figured out how to put it all together at just the right time. With the Rams up next, Michel could, again, be the difference in a game that will likely be another tough battle when they take the field again in two weeks. This entry was posted in 2018 Patriots playoffs, Patriots Commentary on January 21, 2019 by Ian Logue. With a severe cold front coming into Kansas City this weekend, there’s likely to be a fair amount of talk this week about the conditions being tough when the Patriots battle the Chiefs Sunday night. The Patriots are no stranger to playing in the freezing cold in big games, with the AFC Divisional match-up against the Titans back during the 2003/04 playoff run being one of the most memorable. That game was rough. Game time conditions at kickoff saw the temperature at a frigid 4-degrees, with the wind chill putting things at -10. But the Patriots managed to come away with a 17-14 win to advance to the AFC Championship Game, which ultimately led to their second Super Bowl championship in three years. Former Patriots defensive end Willie McGinest, now an analyst for NFL Network, joined WEEI’s Dale and Keefe Tuesday and talked about that night and pointed out that a couple of teammates actually even had to make a trip to the hospital after it was over. 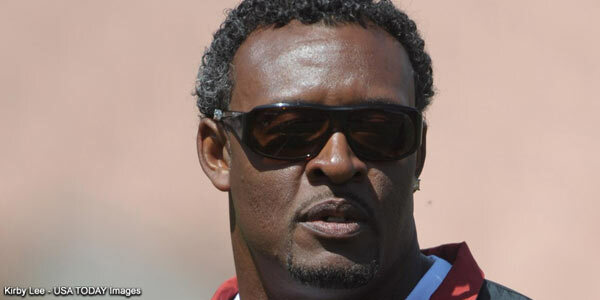 McGinest said that players who tend to be more affected by weather like that are the skilled players, with receivers and running backs generally the ones who have the tougher time in those conditions. We tend to see crazy things in those games, with many players even still choosing to tough it out and not wear sleeves, despite the dangers that come with playing in the frigid elements. Former Patriots quarterback Steve Grogan once discussed what he thought of teammates who opted to go that route and said it never made any sense to him. According to Weather.com, the forecast for Sunday night’s game has the evening temperature at a paltry 6-degrees, which will likely recreate a similar evening for Patriots players. This entry was posted in 2018 Patriots playoffs on January 15, 2019 by Ian Logue. 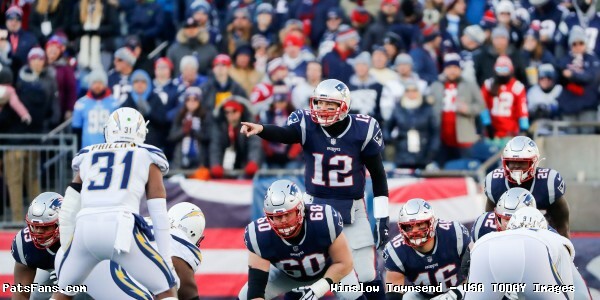 Patriots quarterback Tom Brady might tell people he doesn’t hear the pundits who criticize both himself and the team, but he seemed to have a bit of a chip on his shoulder despite coming away with a huge win over the Chargers on Sunday. The veteran quarterback did an interview after the game with CBS reporter Tracy Wolfson and admitted that he knows that few people had any faith in their chances this season and he’s looking forward to trying to see if he can’t prove them wrong. There’s nothing more dangerous than a player with something to prove. 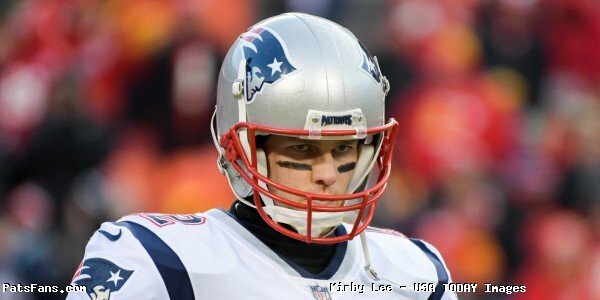 With many in the media likely set to write stories this week about a potential changing of the guard while focusing on Chiefs quarterback Patrick Mahomes, we’ll see if Brady will be able to remind the world he’s not quite done yet when he and the Patriots travel to Kansas City next weekend. This entry was posted in 2018 Patriots playoffs on January 13, 2019 by Ian Logue.